Members of the Gallia Academy volleyball team pose for a photo following the match in which they earned a share of the OVC league title on Thursday in Centenary, Ohio. CHESAPEAKE, Ohio — A fitting way to clinch the title outright. 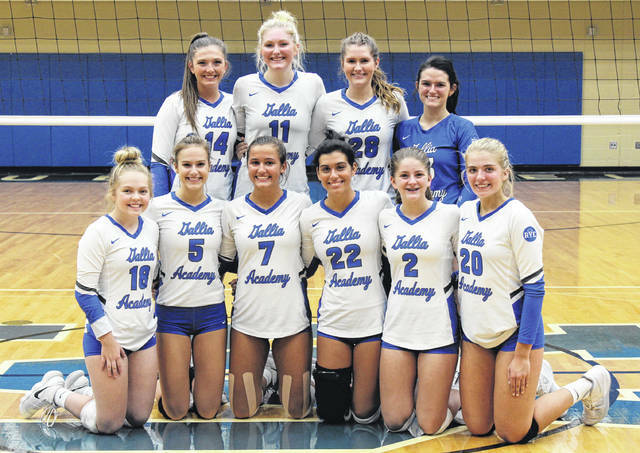 The Gallia Academy volleyball team never trailed in a straight games win over Ohio Valley Conference host Chesapeake on Tuesday evening, with the victory sealing the Blue Angels’ fourth consecutive outright OVC title. The Blue Angels (18-3, 13-0 OVC) — who’ve now won 46 consecutive sets in OVC play — led wire-to-wire in the Tuesday’s opener, scoring the first nine points and allowing just one service point en route to the 25-7 win. Gallia Academy scored the first three points of the second game, storming to a 25-10 victory, in which the Blue Angels earned a match-high eight aces. After a 1-1 tie in the second game, GAHS scored the next five points and led the rest of the way to the 25-12 victory, pounding out a match-best 13 kills in the process. In the win, Gallia Academy had a side-out percentage of 71, while Chesapeake’s was 37.4. The Blue Angels earned 20 aces and a 90.4 serve percentage, to go with 35 kills and a 37.7 hitting percentage. Alex Barnes led the Blue Angels with 19 service points, including six aces. Maddie Wright was next with 14 points and a trio of aces, followed by Ashton Webb with nine and seven aces. Taylor Burnette earned five points and a pair of aces in the win, Hunter Copley ended with four points and two aces, while Peri Martin came up with two points for the victors. Barnes also led GAHS at the net with a dozen kills, followed by Webb with 10. Maddy Petro contributed seven kills and a block to the winning cause, Aubrey Unroe added three kills, Wright chipped in with two kills, while Martin recorded one kill and a match-best 32 assists. Webb led the GAHS defense with nine of the team’s 29 digs. Gallia Academy also swept Chesapeake on Sept. 11 in Centenary. The Blue Angels will go for third consecutive unbeaten league campaign on Thursday at Fairland.